You only need a few ingredients to make an impressive and easy Crescent Rolls Fruit Tart. Join me as we revisit a very popular recipe and celebrate my ten year blogiversary with Walking on Sunshine Recipes! 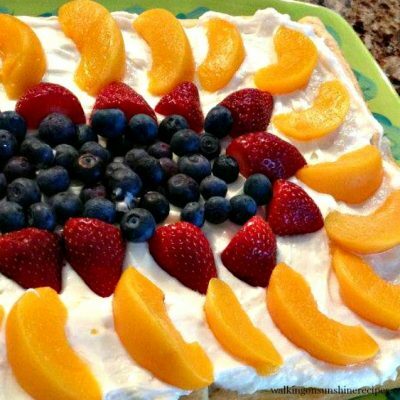 This Crescent Rolls Fruit Tart Recipe is so easy I know it will soon become a favorite dessert for your family as it is for mine. 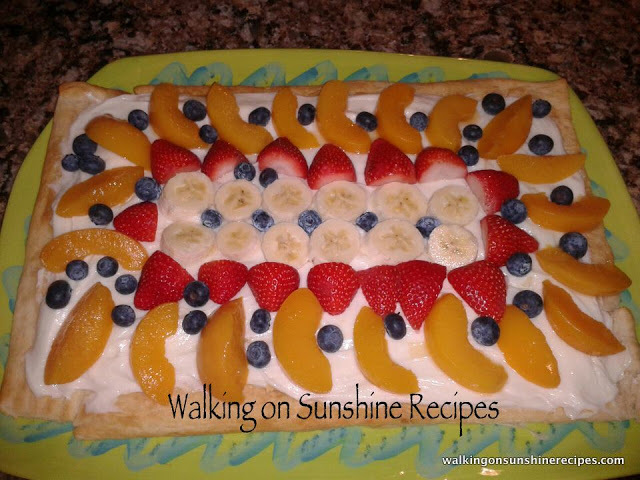 Ten years ago this week my blog, Walking on Sunshine Recipes, was created. The blogging world was so different back in 2008! Blogs were more of an online diary than the wonderful sources of information they are today. Blogging has been an amazing journey for me. I love my WOS readers and followers. And I really have enjoyed sharing a little of my life and what’s been for dinner in my corner of the world with everyone. 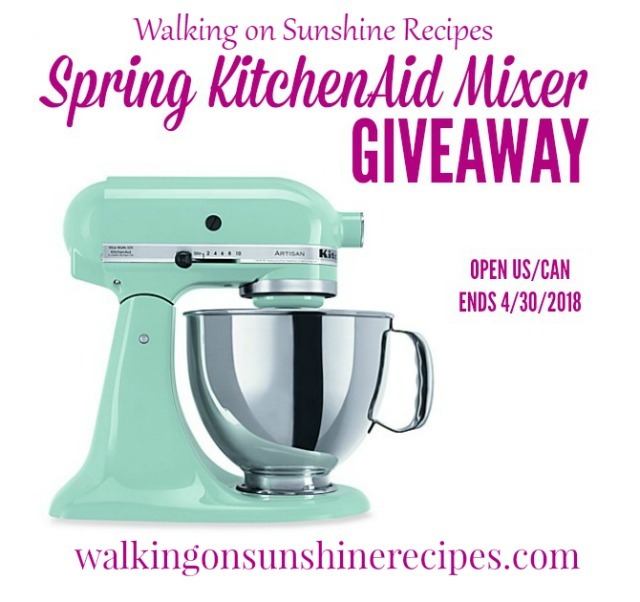 Make sure you join the KitchenAid Mixer Giveaway to continue celebrating 10 years of blogging! When I was trying to figure out how to celebrate ten years of blogging, I thought how fun it would be to revisit a very popular recipe from when I first started sharing recipes here on WOS. I hope you enjoy this recipe as much as my family does. When this originally posted I was thanking you for all the wonderful comments on this post. I enjoyed reading them all again today. It’s always a JOY when your children accomplish something they’ve worked so hard for so many years. Today my son is 21 and a junior at Liberty University. Olivia is married and living in Florida and my “Colonel” is still loving my recipes and my biggest fan! So, let’s reminisce together with this week’s Something Yummy for My Colonel’s Tummy is a DELICIOUS and EASY Fruit Tart. It’s an easy and quick dessert to put together and your family and guests will think you worked hard all day. The crust for this tart is 2 containers of crescent rolls pressed together and baked. It’s flaky and buttery and oh so delicious! Using a hand mixer, beat together the softened cream cheese and sugar. Once combined, fold in the Cool Whip, by hand. Spread over top of cooled crescent rolls. Add your fruit. I used canned peaches (completely drained), fresh strawberries, blueberries and banana. You can use whatever assortment a fruit your family enjoys. If you choose to use bananas, it’s best to slice and add them to the fruit tart right before serving. You can put the tart together and keep in the refrigerator before company arrives. Sometimes it’s fun to put the tart together with your company! 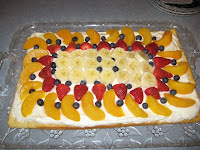 This is the fruit tart I made for my daughter’s birthday a few years ago. She loves bananas, strawberries and peaches. 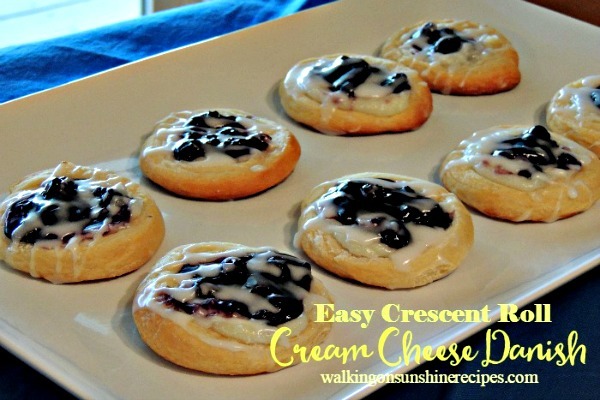 If you like this recipe you might also like the Cream Cheese Danish with Blueberry Topping. 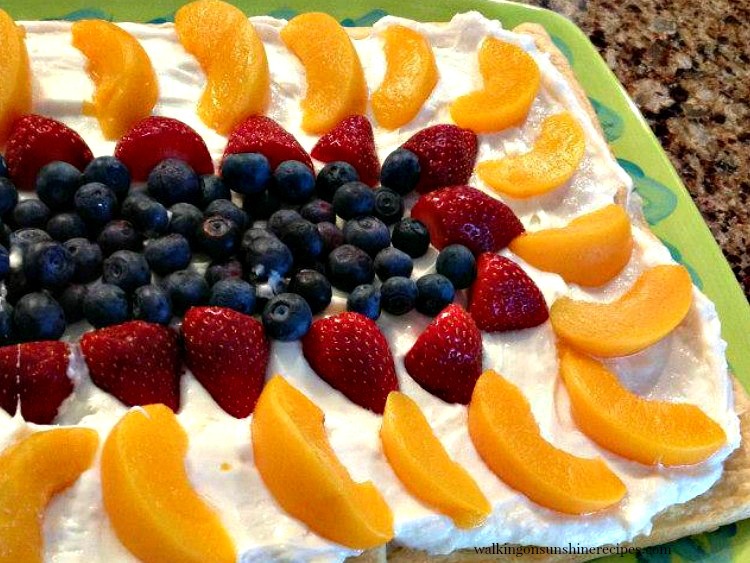 You only need a few ingredients to make an impressive and easy Crescent Rolls Fruit Tart. This is my daughter, Olivia's, favorite dessert and I make it every year for her birthday! Unroll the crescent rolls. Do not separate. 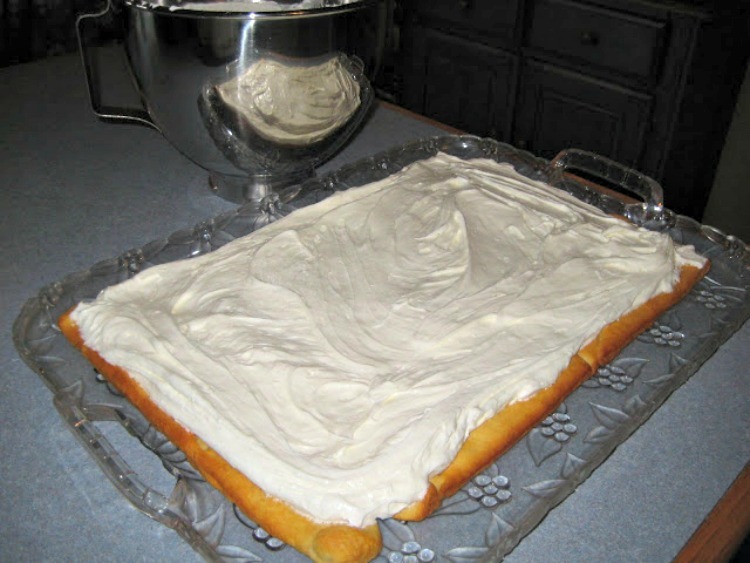 Lay them flat on a baking tray that's been lined with parchment paper. 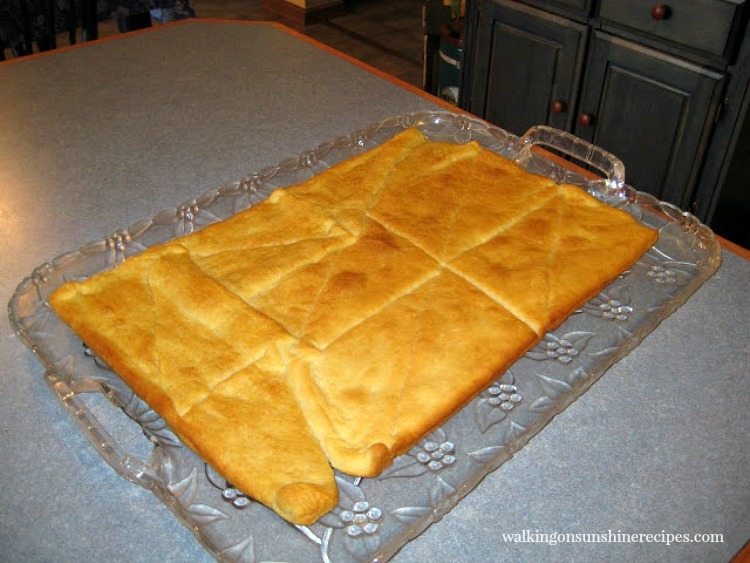 Press the seams together to create one large sheet of crescent rolls. Bake in a 350 degree preheated oven for about 12 to 15 minutes or until it is lightly browned. Allow to cool completely before putting the tart together. In a mixing bowl, combine the softened cream cheese , sugar and vanilla. Gently fold in the Cool Whipped Topping. Once the crescent rolls crust has cooled completely, evenly spread the cream cheese mixture on top. 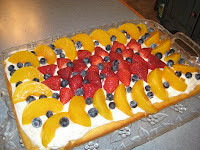 Add the assorted fruit on top in a decorative pattern. Let chill in refrigerator or serve immediately. You can use any combination of fruit that your family enjoys. If you choose to use canned peaches, please make sure you drain them completely before adding to the top of the cream cheese mixture. Here are two of the original photos from when I first published this post in 2012. One tart is made with bananas and one without bananas. Here’s a fun fact about the tray that is in the photos. This tray was used for our wedding reception to hold little tea sandwiches that we served to our guests. I used that tray only for this recipe for 25 years before it broke. It was the perfect size tray for this tart and I’m a little sad it’s broken! Looks Yummy and easy too! I would like to try it. Thank you! Looks like a fabulous summer treat! YUM! Thanks for sharing it! Hope you have a delightful day, Lois! That's such a pretty, summery dessert, Lois! 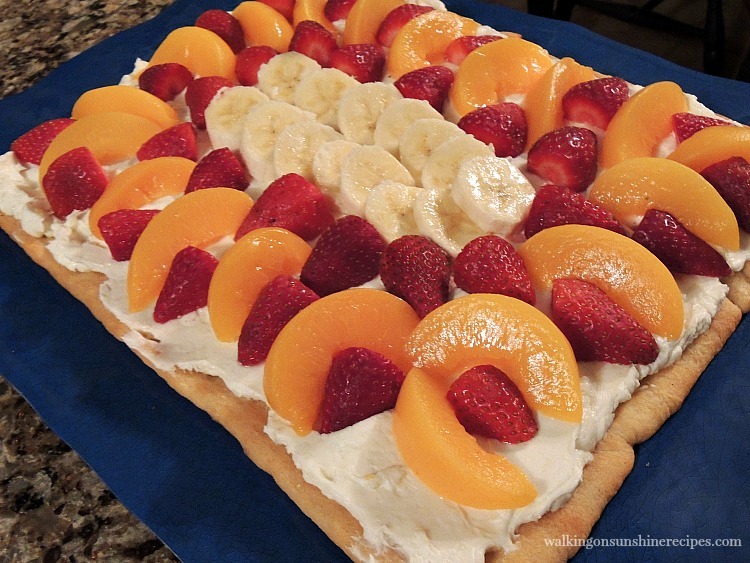 I have been always too scared to try to make a fruit tart, but this looks easy and delicious! what a great treat for these hot summer days. So easy and yummy and pretty! 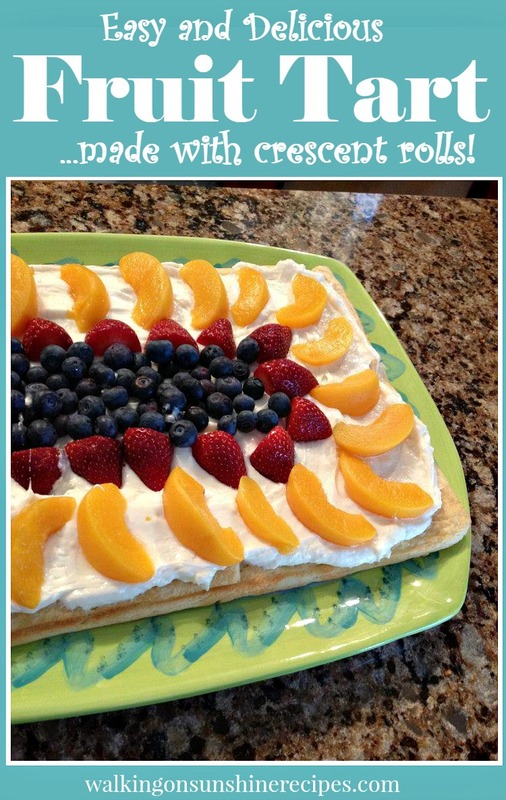 that sounds good… never thought of using crescent rolls for this… and I always have some in my fridge. My mouth is watering. All the food you make, makes me so very hungry. Simple and delicious, what a great combination for summer! Following ya now, and liking ya on Facebook too, from Naptime review's hop. We're riding the wave of life at localsugarhawaii.com and I'd love it if you'd join us for the sweet little ride. Mmmm~ this looks like a perfect summer dessert! Both beautiful and delicious looking!! Looks so good! Perfect treat! Yummy! The presentation is also lovely. This seems like the perfect treat for the summer months! So pretty! I like this better than a sheet cake! I've decided that ALL of your recipes look and sound delicious! Thanks for linking up at Foodie Friends Friday! Oh I remember the first time I had it at your house, then you brought it to a church event! I made it after that a couple of times! Of course mine never looked as pretty as yours but it did taste the same! Congratulations on your ten years!! Thank you Olga. 🙂 Come back tomorrow and join the giveaway!! !